The men's Rolex Yacht-Master is a relatively new addition to the brand's catalog, coming to market in the early 1990s. The original concept behind the Yacht-Master was to developed an opulent variation of the Submariner diver's watch. 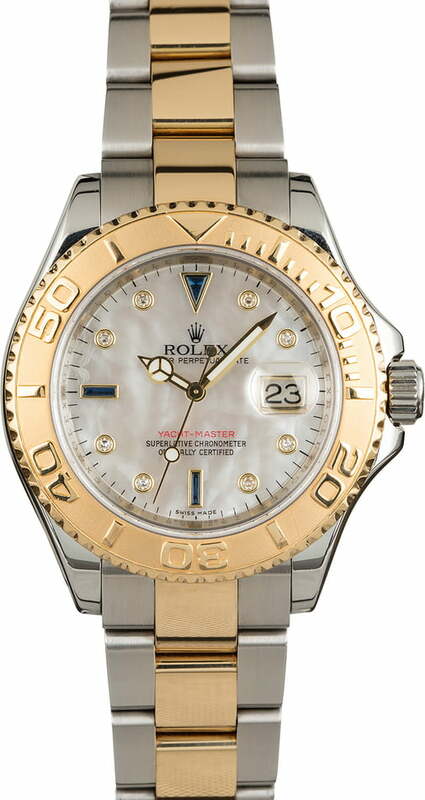 Ultimately, Rolex released the Yacht-Master as its own model and marketed it as a sailing timepiece, equipping it with a standard 100-meter depth rating, a 60-minute Regatta timing bezel, and an opulent design that mirrors the luxurious lifestyle of professional sailing perfectly. The ref. 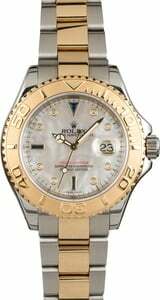 16623 that is presented here today is a striking example of the brand's Regatta tool watch that pairs a versatile two-tone finish with an exceptional "Serti" Mother-of-Peal dial adorned with diamonds and sapphires.